TUSCARORA — Curiosity about flight has led to all types of flying machines in the past century, taking people around the world, but there is still a simple pleasure and thrill of being able to send a model plane into the sky. After so many rainy days, the day’s hot sun and the weekend’s sunny forecast had club President Ed Pollack feeling happy. When asked between running from one place and another to get the event ready, he gave credit where he believes credit is due. 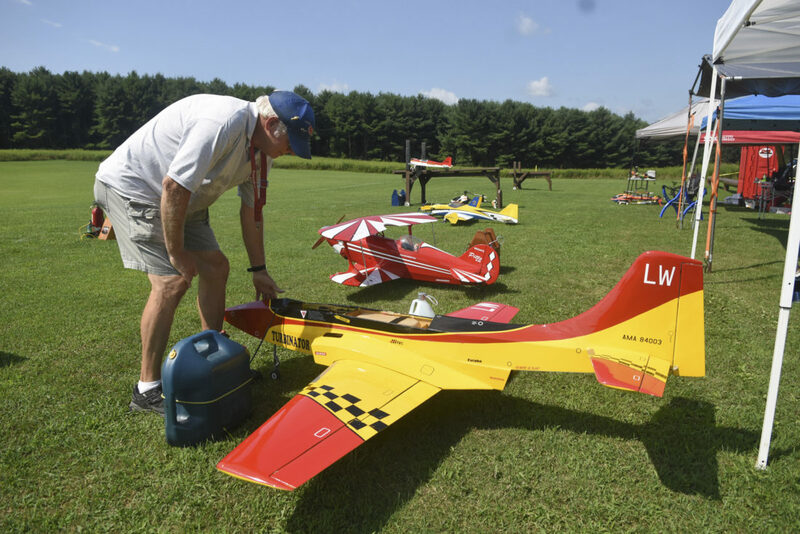 Pollack explained that the Tuscarora R/C club was formed with the vision of having a club where a person could bring his or her family and friends for a day of fun or flying, learn to fly model radio-controlled aircraft or just enjoy watching others fly their planes. The club’s focus is to promote education, advancement and safeguards of remote control modeling activities and to train people to safely and enjoyably fly their model aircraft. Priority is to be able to give back to the community that has supported us by working with youth groups and community organizations. “The Tuscarora R/C club began in 1965 and was officially chartered in 1968 formed by a small group of pilots who, through dedication and hard work, were able to secure the land from the Pennsylvania State Park System that we still share, maintain and enjoy to this day,” Pollack said in the history he provided about the club. “The founding fathers came predominantly from military backgrounds and often shared invaluable stories of WWII, Korea and Vietnam with members and spectators as well. Friendships were made through a common passion of aviation. Some members painstakingly constructed R/C planes patterned after the planes they flew in combat with exacting detail that could only come from firsthand experiences,” Pollack said. A walk around showed the diversity in the R/C model hobby. Kyle Snyder, who lives near Snyders in West Penn Township, is a helicopter enthusiast and showed his skill in piloting “Whiplash” in many highly interesting and tricky maneuvers. Before his show, Snyder said he plans to build a lightweight foam airplane. Some enthusiasts come up with interesting ideas for making planes. David Kessler, Tamaqua, had his newest plane with the theme from Disney’s “Frozen,” complete with characters in the cockpit. He had an extra wing and decided to build the fuselage from scratch. Kessler, who has been in the hobby for 20 years, flew another plane named “Jerry,” though his first attempt hit a snag. After doing his pre-check with Nancy Steven, also of Tamaqua, the plane was placed on the ground, the engine was revved and shortly after entering the grassy flying field, it hit a pothole causing some problems. After working on it for a time, “Jerry” took to the air for a memorable flight. “Any planes larger than 80-inch wingspan are considered ‘giant scale.’ That plane is 86 inches,” Jeff Marks said. Majikas’ collection includes a Fokker D.VII (D7), Piper Cherokee and a PT-19 (pre-1940). “I am a leader member of the Academy of Model Aeronautics, which has 200,000 members,” he said. “We own a 900-acre facility north of Muncie, Indiana. That’s where we have our national model championship that goes on for an entire big thing. It (hobby) is quite a big thing, and it’s quite big worldwide. It made you learn electronics and how to build things in the past, but now things are pretty easy and simple because you buy them ready to go and don’t have to build them from scratch.